First Russian ballistic missile using storable propellants, developed from the German Wasserfall SAM by Korolev's OKB. The design was then spun off to the Makeyev OKB for development of Army (R-17 Scud) and SLBM (R-11FMA) derivatives. AKA: 8A61;8K14;Scud A;SS-1B. Status: Retired 1965. First Launch: 1953-04-18. Last Launch: 1965-05-18. Number: 106 . Payload: 699 kg (1,541 lb). Thrust: 101.00 kN (22,705 lbf). Gross mass: 5,337 kg (11,766 lb). Height: 10.67 m (35.00 ft). Diameter: 0.85 m (2.78 ft). Span: 1.80 m (5.90 ft). Apogee: 160 km (90 mi). The R-11 originated as Theme N-2 of the R-3 IRBM project. This was an alternate approach to delivering nuclear warheads on West European targets - a road-mobile missile of shorter range that could be set up at the forward area of the battlefield and reach enemy targets. A submarine-launched version would allow all of the major cities of Western Europe to be reached. The specification was for a missile of the range and payload of the German V-2, but of less than half the size, using non-cryogenic propellants. The R-11 design adapted the Isayev rocket engine used in the V-300 / R-101 antiaircraft missile (itself a Russian-built version of the German Wasserfall). Following the decision to drop the R-3A, a 20 October 1951 MOP decree authorized work to start on the R-5 and R-11. Due to the extensive work already done under the Theme N-2, the 8 volume R-11 draft project was delivered on 30 November 1951. Korolev did not agree with the production of rockets using the R-11's toxic storable propellants, and project leader Viktor Petrovich Makeyev had to persevere in developing the rocket without his boss' support. The first test flight was made on 18 April 1953. Massive problems were encountered in the difficult test series - with poor-quality kerosene fuel, handling and leakage of the propellants, and reliable start of the engine. But the Red Army saw much more promise in the design than in Korolev's cumbersome liquid oxygen rockets. A government decree was issued on 13 December 1953 for SKB-385 in the Urals to be responsible for series production of the R-11 and its S2.253 engine. SKB-385 had not distinguished itself in 1949-1951 when it was responsible for the first abortive attempt to put the R-1 rocket into production. Following a protracted two-year test series, the design was finally accepted for military service on 13 July 1955. In anticipation of this formal decree, in June of 1955 Makeyev was made Chief Designer at SKB-385, responsible for engineering of the R-11 and future small land and sea based ballistic missiles. SKB-385 was given complete responsibility for development of the sub-launched R-11FM in August 1955. Tests of the R-11FM had begun in February 1955 at Kapustin Yar with three experimental launches of the missile from a standard R-11 launch stand. This was followed by launches from a special stand simulating a ship's motion, developed by A P Abramov. Finally a third test series was conducted from the Project 611 submarine B-57 from 16 September to 13 October 1955 in the White Sea. This demonstrated launches from a pitching surfaced vessel and a total range of 150 km. Following further trials the system was accepted for military surface in 1959, but never deployed on an operational vessel. However the project had cemented Makeyev's relationship with the Soviet Navy, which decided to make him their sole source for all future naval ballistic missiles. Meanwhile Makeyev had moved quickly to redesign the R-11 to remedy all of the basic defects identified in the trials. This included a new, less troublesome, higher performance propellant combination. The state authorized work to begin on the R-11M missile on 26 August 1954. This was followed by the first launch on 30 December 1955 and acceptance of the design for service on 1 April 1958. The final refinement of the R-11 design was the R-17, to be exported and infamous around the world as the Scud-B. In 1958-1959 Makeyev designed and built the first mock-up of the new missile. But by then the decision was made to devote the bureau to sea-launched missiles, and in 1959 the program was transferred to Votkinsk Machine Building Plant. There design work continued with first launch in 1961 and acceptance into military service in 1964. Range 270 km with 690 kg, accuracy 1.5 km/0.75 km. Maximum altitude 78 km. Time of flight 5.4 minutes. Max velocity at burnout 1430 m/s. Data is accurate. Source: placards at Orevo and TsNIIMASH. Maximum range: 260 km (160 mi). Number Standard Warheads: 1. CEP: 5.16 km (3.20 mi). Boost Propulsion: Storable liquid rocket, AK-20I/T-1. Maximum speed: 5,160 kph (3,200 mph). Initial Operational Capability: 1958. Stage 1. 1 x R-11. Gross Mass: 4,660 kg (10,270 lb). Empty Mass: 955 kg (2,105 lb). Thrust (vac): 93.280 kN (20,970 lbf). Isp: 251 sec. Burn time: 78 sec. Isp(sl): 219 sec. Diameter: 0.88 m (2.88 ft). Span: 1.82 m (5.96 ft). Length: 7.42 m (24.34 ft). Propellants: Nitric acid/Kerosene. No Engines: 1. Engine: S2.253. Other designations: 8A61. Status: In Production. First Russian ballistic missile using storable propellants. Enlargement/elaboration of German Wasserfall SAM. Developed by Korolev OKB, then Makeyev OKB spun off to develop Army and SLBM derivatives. Range 270 km with 690 kg, accuracy 1.5 km/0.75 km. Maximum altitude 78 km. Time of flight 5.4 minutes. Max velocity at burnout 1430 m/s. Source: Wall chart, Russian Space Agency HQ, Moscow. R-11FM First Russian submarine-launched ballistic missile. Following protracted testing the design was accepted by the military in 1959 but never put into operational service. R-11M Russian submarine-launched ballistic missile. Improved production version of R-11, not retired until 1977. R-17 Russian short-range ballistic missile. The final refinement of the R-11 design, the R-17, was exported widely and became infamous around the world by its ASCC reporting name - "Scud". It was perhaps the most famous ballistic missile of the post-war period due to its use in the Iran-Iraq 'War of the Cities' and the Gulf War. This was the definitive production version of what was essentially a storable-propellant rocket with the performance of the V-2. The original design was by Makeyev but the missile itself was produced by the Votkinsk Machine Building Plant. R-11A Russian suborbital launch vehicle. 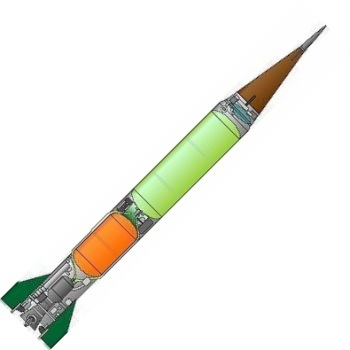 Version of the R-11 'Scud' missile used as a single stage sounding rocket. First launched in 1957, and capable of taking 250 to 400 kg of payload to 100 to 160 km altitude. The payloads were enclosed in a spherical re-entry capsule, which was gyro-stabilized to ensure instruments could be pointed precisely at the sun or other astronomical target. R-11A-MV Russian suborbital launch vehicle. Sounding rocket version of R-11 with increased payload. Shahab 1 Alternate designation for [Hwasong 5]. Al Hussein Iraqi modification of the R-17 that doubled the missile's range at the expense of more than halving the payload and accuracy. 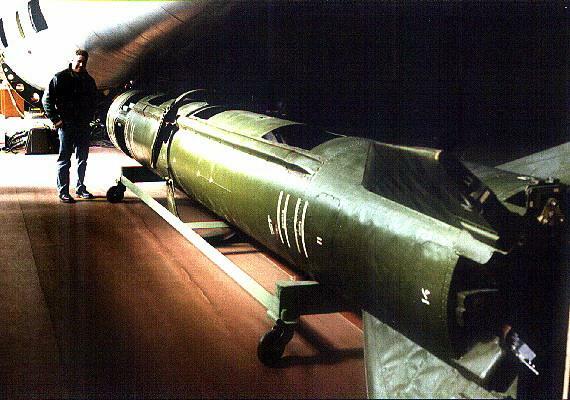 Al Abbas Iraqi modification of the R-17 with an 800-km range, achieved by reducing warhead weight to 125 kg, and increasing propellant load by 30 percent . Short Al Hussein Iraqi short range ballistic missile. Al Hijara Iraqi single-stage missile. Shahab 2 Alternate designation for [Hwasong 6]. Scud Designation applied to foreign launches of the R-17 missile where the model and manufacturer are not known. Scud D Alternate designation for [Hwasong 7]. Scud B Alternate designation for [R-17]. Hwasong 5 North Korean mobile liquid propellant single stage tactical ballistic missile. Reverse-engineered from Russian R-17's provided by Egypt around 1980. Often referred to as 'Scud-B'. 340 km range compared to 300 km for the original R-17 design. Hwasong 6 North Korean mobile liquid propellant single stage tactical ballistic missile. Derived from Russian R-17, often referred to as 'Scud-C'. The Hwasong had a 500 km range, achieved by halving the payload. Family: submarine-launched. Country: Russia. Engines: S2.253. Launch Sites: Yemen, Kapustin Yar, Kapustin Yar V-2. Stages: R-11 stage. Agency: Makeyev bureau. Bibliography: 2, 283, 474, 477, 86, 89. 1949 June - . Launch Vehicle: R-11. Groettrup team designs R-13. - . Nation: Russia. Related Persons: Groettrup. Groettrup group consulted on 'R-13' (code name for R-11?). Specifications include 1000 kg warhead, 120 km range..
1953 April 18 - . Launch Site: Kapustin Yar. Launch Vehicle: R-11. Nation: Russia. Agency: Korolev bureau. Apogee: 150 km (90 mi). Massive problems were encountered in the difficult test series - with poor-quality kerosene fuel, handling and leakage of the propellants, and reliable start of the engine. But the Red Army saw much more promise in the design than in Korolev's cumbersome liquid oxygen rockets. 1953 May 1 - . Launch Site: Kapustin Yar. Launch Vehicle: R-11. Test mission - . Nation: Russia. Agency: Korolev bureau. Apogee: 150 km (90 mi). 1953 May 9 - . Launch Site: Kapustin Yar. Launch Vehicle: R-11. Nation: Russia. Apogee: 150 km (90 mi). 1953 May 17 - . Launch Site: Kapustin Yar. Launch Vehicle: R-11. 1953 May 22 - . Launch Site: Kapustin Yar. Launch Vehicle: R-11. 1953 May 26 - . Launch Site: Kapustin Yar. Launch Vehicle: R-11. 1953 May 27 - . Launch Site: Kapustin Yar. Launch Vehicle: R-11. 1953 May 28 - . Launch Site: Kapustin Yar. Launch Vehicle: R-11. 1953 May 30 - . Launch Site: Kapustin Yar. Launch Vehicle: R-11. 1953 June 3 - . Launch Site: Kapustin Yar. Launch Vehicle: R-11. 1953 December 13 - . Launch Vehicle: R-11. R-11 production decree - . Nation: Russia. A government decree was issued for SKB-385 in the Urals to be responsible for series production of the R-11 and its S2.253 engine. SKB-385 had not distinguished itself in 1949-1951 when it was responsible for the first abortive attempt to put the R-1 rocket into production. 1954 January 26 - . LV Family: R-11. Launch Vehicle: R-11FM. R-11FM authorised. - . Nation: Russia. Council of Soviet Ministers (SM) Decree 'On approval of work on the R-11FM' was issued..
1954 February 3 - . LV Family: R-11. Launch Vehicle: R-11FM. R-11FM platform development authorised - . Nation: Russia. Council of Soviet Ministers (SM) Decree 'On creation of the submerged submarine-launched ballistic missile' was issued..
1954 April 20 - . Launch Site: Kapustin Yar. Launch Vehicle: R-11. 1954 April 24 - . Launch Site: Kapustin Yar. Launch Vehicle: R-11. 1954 April 27 - . Launch Site: Kapustin Yar. Launch Vehicle: R-11. 1954 May 1 - . Launch Site: Kapustin Yar. Launch Vehicle: R-11. 1954 May 4 - . Launch Site: Kapustin Yar. Launch Vehicle: R-11. 1954 May 5 - . Launch Site: Kapustin Yar. Launch Vehicle: R-11. 1954 May 6 - . Launch Site: Kapustin Yar. Launch Vehicle: R-11. 1954 May 8 - . Launch Site: Kapustin Yar. Launch Vehicle: R-11. 1954 May 12 - . Launch Site: Kapustin Yar. Launch Vehicle: R-11. 1954 May 13 - . Launch Site: Kapustin Yar. Launch Vehicle: R-11. 1954 July 13 - . Launch Vehicle: R-11. R-11 accepted into military service. - . Nation: Russia. Council of Soviet Ministers (SM) Decree 'On adoption of the R-11 into armaments' was issued..
1954 August 26 - . Launch Vehicle: R-11. R-11M development authorised. - . Nation: Russia. Council of Soviet Ministers (SM) Decree 'On approval of work on the R-11M missile' was issued..
1954 September 26 - . Launch Site: Kapustin Yar. Launch Complex: Kapustin Yar SM-49. LV Family: R-11. Launch Vehicle: R-11FM. 1954 October 1 - . Launch Site: Kapustin Yar. LV Family: R-11. Launch Vehicle: R-11FM. 1954 October 20 - . Launch Site: Kapustin Yar. LV Family: R-11. Launch Vehicle: R-11FM. 1954 December 1 - . Launch Site: Kapustin Yar. Launch Vehicle: R-11. 1955 January 1 - . Launch Site: Kapustin Yar. Launch Vehicle: R-11. 1955 January 14 - . Launch Site: Kapustin Yar. Launch Vehicle: R-11. 1955 January 21 - . Launch Site: Kapustin Yar. Launch Vehicle: R-11. 1955 February - . LV Family: R-11. Launch Vehicle: R-11FM. Tests of the R-11FM SLBM begun at Kapustin Yar - . Nation: Russia. Tests began with three experimental launches of the missile from a standard R-11 launch stand. This was followed by launches from a special stand simulating a ship's motion, developed by A P Abramov..
1955 February 1 - . Launch Site: Kapustin Yar. Launch Vehicle: R-11. 1955 February 2 - . Launch Site: Kapustin Yar. Launch Vehicle: R-11. Nation: Russia. Apogee: 0 km (0 mi). 1955 February 10 - . Launch Site: Kapustin Yar. Launch Vehicle: R-11. 1955 February 11 - . Launch Site: Kapustin Yar. Launch Vehicle: R-11. 1955 February 15 - . Launch Site: Kapustin Yar. Launch Vehicle: R-11. 1955 February 17 - . Launch Site: Kapustin Yar. Launch Vehicle: R-11. 1955 February 19 - . Launch Site: Kapustin Yar. Launch Vehicle: R-11. 1955 February 21 - . Launch Site: Kapustin Yar. Launch Vehicle: R-11. 1955 February 22 - . Launch Site: Kapustin Yar. Launch Vehicle: R-11. 1955 May 1 - . Launch Site: Kapustin Yar. LV Family: R-11. Launch Vehicle: R-11FM. 1955 May 21 - . Launch Site: Kapustin Yar. LV Family: R-11. Launch Vehicle: R-11FM. 1955 June 1 - . Launch Site: Kapustin Yar. LV Family: R-11. Launch Vehicle: R-11FM. 1955 July 1 - . Launch Site: Kapustin Yar. LV Family: R-11. Launch Vehicle: R-11FM. 1955 July 13 - . Launch Vehicle: R-11. R-11 accepted for military service - . Nation: Russia. 1955 July 30 - . Launch Site: Kapustin Yar. LV Family: R-11. Launch Vehicle: R-11FM. 1955 August - . LV Family: R-11. Launch Vehicle: R-11FM. SKB-385 given complete responsibility for development of the sub-launched R-11FM - . Nation: Russia. This derivative of the land-based R-11 ('Scud') was the first Soviet SLBM..
1955 September 12 - . 14:32 GMT - . Launch Site: White Sea Launch Area. Launch Pad: 65.5 N x 38.0 E. Launch Platform: B-67. LV Family: R-11. Launch Vehicle: R-11FM. Nation: Russia. Agency: Korolev bureau. Apogee: 150 km (90 mi). The third test series was conducted from the Project 611 submarine B-67 through 13 October 1955 in the White Sea. This demonstrated launches from a pitching surfaced vessel and a total range of 150 km..
1955 December 30 - . Launch Site: Kapustin Yar. LV Family: R-11. Launch Vehicle: R-11M. 1956 January 1 - . Launch Site: Kapustin Yar. LV Family: R-11. Launch Vehicle: R-11M. 1956 January 11 - . Launch Site: Kapustin Yar. LV Family: R-11. Launch Vehicle: R-11M. LKI 1A - . Nation: Russia. Apogee: 40 km (24 mi). 1956 January 14 - . Launch Site: Kapustin Yar. LV Family: R-11. Launch Vehicle: R-11M. 1956 January 19 - . Launch Site: Kapustin Yar. LV Family: R-11. Launch Vehicle: R-11M. 1956 January 29 - . Launch Site: Kapustin Yar. Launch Vehicle: R-11. Production launch - . Nation: Russia. Apogee: 150 km (90 mi). 1956 January 31 - . Launch Site: Kapustin Yar. Launch Vehicle: R-11. 1956 February 6 - . Launch Site: Kapustin Yar. LV Family: R-11. Launch Vehicle: R-11M. 1956 February 8 - . Launch Site: Kapustin Yar. LV Family: R-11. Launch Vehicle: R-11M. 1956 February 9 - . Launch Site: Kapustin Yar. LV Family: R-11. Launch Vehicle: R-11M. 1956 February 11 - . Launch Site: Kapustin Yar. LV Family: R-11. Launch Vehicle: R-11M. 1956 February 25 - . Launch Site: Kapustin Yar. LV Family: R-11. Launch Vehicle: R-11M. LKI 1A - . Nation: Russia. Apogee: 80 km (49 mi). 1956 February 27 - . Launch Site: Kapustin Yar. LV Family: R-11. Launch Vehicle: R-11M. 1956 April 20 - . Launch Site: Kapustin Yar. Launch Vehicle: R-11. Production launch - . Nation: Russia. Apogee: 10 km (6 mi). 1956 June 28 - . Launch Site: Kapustin Yar. Launch Vehicle: R-11. Production launch - . Nation: Russia. Apogee: 30 km (18 mi). 1956 July 11 - . Launch Vehicle: R-11. Sounding rocket variant of the R-11 authorised. - . Nation: Russia. Decree 'On approval of work on the R-11A missile for the IGY' was issued..
1956 August 28 - . Launch Site: Kapustin Yar. LV Family: R-11. Launch Vehicle: R-11M. LKI 1B - . Nation: Russia. Apogee: 40 km (24 mi). 1956 September 13 - . Launch Site: Kapustin Yar. LV Family: R-11. Launch Vehicle: R-11M. LKI 1B - . Nation: Russia. Apogee: 80 km (49 mi). 1956 September 20 - . Launch Site: Kapustin Yar. LV Family: R-11. Launch Vehicle: R-11M. 1956 October 31 - . Launch Site: Sea Launch Area. Launch Pad: BELA. Launch Platform: B-67. LV Family: R-11. Launch Vehicle: R-11FM. 1956 December 26 - . Launch Site: Sea Launch Area. Launch Pad: BELA. Launch Platform: B-67. LV Family: R-11. Launch Vehicle: R-11FM. 1957 January 4 - . Launch Site: Kapustin Yar. Launch Vehicle: R-11. Nation: Russia. Apogee: 80 km (49 mi). 1957 January 25 - . Launch Site: Kapustin Yar. Launch Vehicle: R-11. 1957 February 1 - . Launch Site: Kapustin Yar. Launch Vehicle: R-11. 1957 February 2 - . Launch Site: Kapustin Yar. Launch Vehicle: R-11. 1957 February 6 - . Launch Site: Kapustin Yar. Launch Vehicle: R-11. 1957 February 20 - . Launch Site: Kapustin Yar. Launch Vehicle: R-11. 1957 March 25 - . Launch Site: Kapustin Yar. LV Family: R-11. Launch Vehicle: R-11M. Test mission - . Nation: Russia. Agency: Korolev bureau. Apogee: 200 km (120 mi). 1957 April 1 - . Launch Site: Kapustin Yar. LV Family: R-11. Launch Vehicle: R-11M. 1957 April 9 - . Launch Site: Kapustin Yar. LV Family: R-11. Launch Vehicle: R-11M. Nation: Russia. Apogee: 40 km (24 mi). 1957 April 11 - . Launch Site: Kapustin Yar. LV Family: R-11. Launch Vehicle: R-11M. 1957 August 1 - . Launch Site: Kapustin Yar. LV Family: R-11. Launch Vehicle: R-11M. 1957 August 8 - . Launch Site: Kapustin Yar. Launch Vehicle: R-11. 1957 August 22 - . Launch Site: Kapustin Yar. Launch Vehicle: R-11. ZI - . Nation: Russia. Apogee: 150 km (90 mi). 1957 August 23 - . Launch Site: Kapustin Yar. Launch Vehicle: R-11. 1957 August 26 - . Launch Site: Kapustin Yar. LV Family: R-11. Launch Vehicle: R-11M. Nation: Russia. Apogee: 86 km (53 mi). 1957 August 27 - . Launch Site: Kapustin Yar. LV Family: R-11. Launch Vehicle: R-11M. 1957 August 28 - . Launch Site: Kapustin Yar. LV Family: R-11. Launch Vehicle: R-11M. 1957 August 30 - . Launch Site: Kapustin Yar. LV Family: R-11. Launch Vehicle: R-11M. 1957 September 1 - . Launch Site: Kapustin Yar. LV Family: R-11. Launch Vehicle: R-11M. 1957 September 2 - . Launch Site: Kapustin Yar. LV Family: R-11. Launch Vehicle: R-11M. 1957 September 27 - . Launch Site: Kapustin Yar. Launch Vehicle: R-11. 1957 October 6 - . Launch Site: Kapustin Yar. Launch Vehicle: R-11. 1957 November 18 - . Launch Site: Kapustin Yar. Launch Vehicle: R-11. 1957 November 20 - . Launch Site: Kapustin Yar. Launch Vehicle: R-11. 1957 November 26 - . Launch Site: Kapustin Yar. Launch Vehicle: R-11. 1957 November 27 - . Launch Site: Kapustin Yar. Launch Vehicle: R-11. 1957 November 29 - . Launch Site: Kapustin Yar. Launch Vehicle: R-11. 1957 December 11 - . Launch Site: Kapustin Yar. Launch Vehicle: R-11. 1957 December 12 - . Launch Site: Kapustin Yar. Launch Vehicle: R-11. 1957 December 16 - . Launch Site: Kapustin Yar. Launch Vehicle: R-11. 1957 December 26 - . Launch Site: Kapustin Yar. Launch Vehicle: R-11. 1957 December 28 - . Launch Site: Kapustin Yar. Launch Vehicle: R-11. 1957 December 31 - . Launch Site: Kapustin Yar. Launch Vehicle: R-11. 1958 March 8 - . Launch Site: Kapustin Yar. Launch Vehicle: R-11. 1958 March 31 - . Launch Site: Sea Launch Area. Launch Pad: BELA. Launch Platform: B-67. LV Family: R-11. Launch Vehicle: R-11FM. 1958 April 1 - . Launch Vehicle: R-11. R-11M accepted into military service. - . Nation: Russia. Decree 'On adoption of the R-11M into armaments' was issued..
1958 May 25 - . Launch Site: Sea Launch Area. Launch Pad: BELA. Launch Platform: B-67. LV Family: R-11. Launch Vehicle: R-11FM. 1958 May 26 - . Launch Site: Sea Launch Area. Launch Pad: BELA. Launch Platform: B-67. LV Family: R-11. Launch Vehicle: R-11FM. 1958 May 31 - . Launch Site: Kapustin Yar. Launch Vehicle: R-11. 1958 July 8 - . Launch Site: Kapustin Yar. Launch Vehicle: R-11. 1958 July 31 - . Launch Site: Kapustin Yar. Launch Vehicle: R-11. 1958 August 1 - . Launch Site: Kapustin Yar. Launch Vehicle: R-11. 1958 August 6 - . Launch Site: Kapustin Yar. Launch Vehicle: R-11. 1958 September 1 - . Launch Site: Kapustin Yar. Launch Vehicle: R-11. 1958 September 6 - . Launch Pad: Pacific Ocean, 40.0 N x 170.0 E. Launch Platform: B-62. LV Family: R-11. Launch Vehicle: R-11FM. 1958 September 8 - . Launch Site: Kapustin Yar. Launch Vehicle: R-11. 1958 September 18 - . Launch Site: Kapustin Yar. Launch Vehicle: R-11. 1958 September 23 - . Launch Site: Kapustin Yar. Launch Vehicle: R-11. 1958 September 30 - . Launch Site: Kapustin Yar. Launch Vehicle: R-11. 1958 October 4 - . 15:08 GMT - . Launch Site: Kapustin Yar. Launch Complex: Kapustin Yar V-2. LV Family: R-11. Launch Vehicle: R-11A. Aeronomy mission - . Nation: Russia. Agency: AN. Apogee: 103 km (64 mi). 1958 October 5 - . Launch Site: Kapustin Yar. LV Family: R-11. Launch Vehicle: R-11M. 1958 October 8 - . Launch Site: Kapustin Yar. LV Family: R-11. Launch Vehicle: R-11M. 1958 October 10 - . Launch Site: Kapustin Yar. Launch Complex: Kapustin Yar V-2. LV Family: R-11. Launch Vehicle: R-11A. 1958 October 30 - . Launch Site: Kapustin Yar. LV Family: R-11. Launch Vehicle: R-11M. 1958 October 31 - . Launch Site: Kheysa. LV Family: R-11. Launch Vehicle: R-11A. First R-11A? Aeronomy mission - . Nation: Russia. Agency: AN. Apogee: 103 km (64 mi). 1958 October 31 - . Launch Site: Kapustin Yar. LV Family: R-11. Launch Vehicle: R-11M. 1958 November 6 - . Launch Site: Kheysa. LV Family: R-11. Launch Vehicle: R-11A. 1958 November 19 - . Launch Site: Kheysa. LV Family: R-11. Launch Vehicle: R-11A. 1958 November 21 - . Launch Site: Kapustin Yar. LV Family: R-11. Launch Vehicle: R-11M. 1958 November 28 - . Launch Site: Kapustin Yar. LV Family: R-11. Launch Vehicle: R-11M. 1958 December 2 - . Launch Site: Kapustin Yar. LV Family: R-11. Launch Vehicle: R-11M. 1958 December 23 - . Launch Site: Kheysa. LV Family: R-11. Launch Vehicle: R-11A. Aeronomy mission - . Nation: Russia. Agency: AN. Apogee: 100 km (60 mi). 1958 December 25 - . Launch Site: Kheysa. LV Family: R-11. Launch Vehicle: R-11A. Aeronomy mission - . Nation: Russia. Agency: AN. Apogee: 102 km (63 mi). 1958 December 27 - . Launch Site: Kapustin Yar. Launch Vehicle: R-11. 1958 December 30 - . Launch Site: Kapustin Yar. LV Family: R-11. Launch Vehicle: R-11M. 1959 - . Launch Site: Sea Launch Area. Launch Pad: BELA. Launch Platform: B-67. LV Family: R-11. Launch Vehicle: R-11FM. FAILURE: Failure. Test mission - . Nation: Russia. Agency: VMF. Apogee: 0 km (0 mi). 1959 January 12 - . Launch Site: Kapustin Yar. Launch Vehicle: R-11. 1959 January 13 - . Launch Site: Kapustin Yar. Launch Vehicle: R-11. 1959 January 29 - . Launch Site: Kapustin Yar. Launch Vehicle: R-11. 1959 January 29 - . Launch Site: Kapustin Yar. LV Family: R-11. Launch Vehicle: R-11M. 1959 January 30 - . Launch Site: Kapustin Yar. LV Family: R-11. Launch Vehicle: R-11M. 1959 February 20 - . LV Family: R-11. Launch Vehicle: R-11FM. R-11FM accepted into military service. - . Nation: Russia. Decree 'On adoption of the R-11FM into armaments' was issued. The first Soviet SLBM system was accepted, but never deployed on an operational vessel. However the project had cemented Makeyev's relationship with the Soviet Navy, which decided to make him their sole source for all future naval ballistic missiles. 1959 March 4 - . Launch Site: Kapustin Yar. Launch Vehicle: R-11. 1959 March 12 - . Launch Site: Kapustin Yar. Launch Vehicle: R-11. 1959 March 13 - . Launch Site: Kapustin Yar. Launch Vehicle: R-11. 1959 March 30 - . Launch Site: Kapustin Yar. LV Family: R-11. Launch Vehicle: R-11M. 1959 April 20 - . Launch Site: Kapustin Yar. LV Family: R-11. Launch Vehicle: R-11M. 1959 April 23 - . Launch Site: Kapustin Yar. LV Family: R-11. Launch Vehicle: R-11M. Nation: Russia. Agency: UNRV. Apogee: 80 km (49 mi). 1959 April 24 - . Launch Site: Kapustin Yar. LV Family: R-11. Launch Vehicle: R-11M. 1959 April 28 - . Launch Site: Kapustin Yar. Launch Vehicle: R-11. Nation: Russia. Agency: UNRV. Apogee: 150 km (90 mi). 1959 April 29 - . Launch Site: Kapustin Yar. LV Family: R-11. Launch Vehicle: R-11M. 1959 May 15 - . Launch Site: Kapustin Yar. Launch Vehicle: R-11. 1959 May 19 - . Launch Site: Kapustin Yar. Launch Vehicle: R-11. 1959 June 6 - . Launch Site: Kapustin Yar. LV Family: R-11. Launch Vehicle: R-11M. 1959 June 10 - . Launch Site: Kapustin Yar. LV Family: R-11. Launch Vehicle: R-11M. 1959 June 13 - . Launch Site: Kapustin Yar. LV Family: R-11. Launch Vehicle: R-11M. 1959 June 17 - . Launch Site: Kapustin Yar. LV Family: R-11. Launch Vehicle: R-11M. 1959 June 18 - . Launch Site: Kapustin Yar. LV Family: R-11. Launch Vehicle: R-11M. 1959 June 20 - . Launch Site: Kapustin Yar. LV Family: R-11. Launch Vehicle: R-11M. 1959 July 3 - . Launch Site: Kapustin Yar. LV Family: R-11. Launch Vehicle: R-11M. 1959 July 14 - . Launch Site: Kapustin Yar. LV Family: R-11. Launch Vehicle: R-11M. 1959 July 15 - . Launch Site: Kapustin Yar. LV Family: R-11. Launch Vehicle: R-11M. 1959 July 20 - . Launch Site: Kapustin Yar. LV Family: R-11. Launch Vehicle: R-11M. 1959 July 20 - . Launch Site: Kapustin Yar. Launch Complex: Kapustin Yar V-2. LV Family: R-11. Launch Vehicle: R-11A. Aeronomy mission - . Nation: Russia. Agency: AN. Apogee: 200 km (120 mi). 1959 July 21 - . 02:00 GMT - . Launch Site: Kapustin Yar. Launch Complex: Kapustin Yar V-2. LV Family: R-11. Launch Vehicle: R-11A. Ionosphere / aeronomy / solar x-ray mission - . Nation: Russia. Agency: MVS. Apogee: 105 km (65 mi). 1959 July 21 - . 14:00 GMT - . Launch Site: Kapustin Yar. Launch Complex: Kapustin Yar V-2. LV Family: R-11. Launch Vehicle: R-11A. 1959 July 22 - . 01:14 GMT - . Launch Site: Kapustin Yar. Launch Complex: Kapustin Yar V-2. LV Family: R-11. Launch Vehicle: R-11A. Ionosphere / aeronomy mission - . Nation: Russia. Agency: MVS. Apogee: 211 km (131 mi). 1959 July 24 - . Launch Site: Kapustin Yar. LV Family: R-11. Launch Vehicle: R-11M. 1959 July 27 - . Launch Site: Kapustin Yar. LV Family: R-11. Launch Vehicle: R-11M. 1959 July 28 - . Launch Site: Kapustin Yar. LV Family: R-11. Launch Vehicle: R-11M. 1959 July 30 - . Launch Site: Kapustin Yar. LV Family: R-11. Launch Vehicle: R-11M. 1959 July 31 - . Launch Site: Kapustin Yar. LV Family: R-11. Launch Vehicle: R-11M. 1959 August 7 - . Launch Site: Kapustin Yar. LV Family: R-11. Launch Vehicle: R-11M. 1959 August 17 - . Launch Site: Kapustin Yar. LV Family: R-11. Launch Vehicle: R-11M. 1959 August 19 - . Launch Site: Kapustin Yar. LV Family: R-11. Launch Vehicle: R-11M. 1959 August 22 - . Launch Site: Kapustin Yar. LV Family: R-11. Launch Vehicle: R-11M. 1959 September 3 - . Launch Site: Kapustin Yar. LV Family: R-11. Launch Vehicle: R-11M. 1959 September 7 - . Launch Site: Kapustin Yar. LV Family: R-11. Launch Vehicle: R-11M. 1959 September 8 - . Launch Site: Kapustin Yar. LV Family: R-11. Launch Vehicle: R-11M. 1959 September 18 - . Launch Site: Kapustin Yar. LV Family: R-11. Launch Vehicle: R-11M. 1959 September 22 - . Launch Site: Kapustin Yar. LV Family: R-11. Launch Vehicle: R-11M. 1959 September 25 - . Launch Site: Kapustin Yar. LV Family: R-11. Launch Vehicle: R-11M. 1959 October 1 - . Launch Site: Kapustin Yar. LV Family: R-11. Launch Vehicle: R-11M. 1959 October 3 - . Launch Site: Kapustin Yar. LV Family: R-11. Launch Vehicle: R-11M. 1959 October 9 - . Launch Site: Kapustin Yar. LV Family: R-11. Launch Vehicle: R-11M. 1959 October 15 - . Launch Site: Kheysa. LV Family: R-11. Launch Vehicle: R-11A. 1959 October 15 - . Launch Site: Kapustin Yar. LV Family: R-11. Launch Vehicle: R-11M. 1959 October 20 - . Launch Site: Kapustin Yar. LV Family: R-11. Launch Vehicle: R-11M. 1959 November 26 - . Launch Site: Kapustin Yar. LV Family: R-11. Launch Vehicle: R-11M. 1959 November 27 - . Launch Site: Kapustin Yar. LV Family: R-11. Launch Vehicle: R-11M. 1959 December 3 - . Launch Site: Kheysa. LV Family: R-11. Launch Vehicle: R-11A. 1959 December 12 - . Launch Site: Kapustin Yar. LV Family: R-11. Launch Vehicle: R-11M. 1959 December 17 - . Launch Site: Kapustin Yar. LV Family: R-11. Launch Vehicle: R-11M. 1959 December 19 - . Launch Site: Kapustin Yar. LV Family: R-11. Launch Vehicle: R-11M. 1959 December 24 - . Launch Site: Kapustin Yar. Launch Vehicle: R-11. 1959 December 25 - . Launch Site: Kapustin Yar. LV Family: R-11. Launch Vehicle: R-11M. 1959 December 26 - . Launch Site: Kapustin Yar. LV Family: R-11. Launch Vehicle: R-11M. 1959 December 27 - . Launch Site: Kapustin Yar. Launch Vehicle: R-11. 1959 December 27 - . Launch Site: Kapustin Yar. LV Family: R-11. Launch Vehicle: R-11M. 1959 December 28 - . Launch Site: Kapustin Yar. Launch Vehicle: R-11. 1959 December 29 - . Launch Site: Kapustin Yar. Launch Vehicle: R-11. 1960 June 23 - . 05:00 GMT - . Launch Site: Kapustin Yar. Launch Complex: Kapustin Yar V-2. LV Family: R-11. Launch Vehicle: R-11A. Aeronomy / ionosphere mission - . Nation: Russia. Agency: AN. Apogee: 200 km (120 mi). 1960 July 15 - . Launch Site: Kapustin Yar. Launch Complex: Kapustin Yar V-2. LV Family: R-11. Launch Vehicle: R-11A. Ionosphere / aeronomy mission - . Nation: Russia. Agency: AN. Apogee: 206 km (128 mi). 1960 September 10 - . Launch Site: Sea Launch Area. Launch Pad: BELA. Launch Platform: B-67. LV Family: R-11. Launch Vehicle: R-11FM. Test mission - . Nation: Russia. Agency: VMF. Apogee: 200 km (120 mi). 1960 September 21 - . Launch Site: Kapustin Yar. Launch Complex: Kapustin Yar V-2. LV Family: R-11. Launch Vehicle: R-11A. Aeronomy mission - . Nation: Russia. Agency: AN. Apogee: 210 km (130 mi). 1960 September 23 - . Launch Site: Kapustin Yar. Launch Complex: Kapustin Yar V-2. LV Family: R-11. Launch Vehicle: R-11A. Ionosphere / aeronomy mission - . Nation: Russia. Agency: AN. Apogee: 200 km (120 mi). 1961 February 2 - . Launch Site: Kapustin Yar. Launch Complex: Kapustin Yar V-2. LV Family: R-11. Launch Vehicle: R-11A. 1961 February 15 - . 08:20 GMT - . Launch Site: Kapustin Yar. Launch Complex: Kapustin Yar V-2. LV Family: R-11. Launch Vehicle: R-11A. Ultraviolet ozone spectra Aeronomy / Solar Eclipse mission - . Nation: Russia. Agency: AN. Apogee: 96 km (59 mi). 1961 September 23 - . Launch Site: Kapustin Yar. Launch Complex: Kapustin Yar V-2. LV Family: R-11. Launch Vehicle: R-11A. 1961 October 27 - . Launch Site: Kapustin Yar. Launch Complex: Kapustin Yar V-2. LV Family: R-11. Launch Vehicle: R-11A. 1962 - . Launch Site: Kapustin Yar. Launch Complex: Kapustin Yar V-2. LV Family: R-11. Launch Vehicle: R-11A-MV. Test mission - . Nation: Russia. Agency: AN. Apogee: 200 km (120 mi). 1963 January 27 - . Launch Site: Kapustin Yar. Launch Complex: Kapustin Yar V-2. LV Family: R-11. Launch Vehicle: R-11A. Ionosphere mission - . Nation: Russia. Agency: AN. Apogee: 200 km (120 mi). 1965 May 7 - . 07:28 GMT - . Launch Site: Kapustin Yar. Launch Complex: Kapustin Yar V-2. Launch Vehicle: R-11. Nation: Russia. Agency: RVSN. Apogee: 200 km (120 mi). 1965 May 8 - . 10:47 GMT - . Launch Site: Kapustin Yar. Launch Complex: Kapustin Yar V-2. Launch Vehicle: R-11. 1965 May 14 - . 19:12 GMT - . Launch Site: Kapustin Yar. Launch Complex: Kapustin Yar V-2. Launch Vehicle: R-11. Ionosphere mission? - . Nation: Russia. Agency: RVSN. Apogee: 200 km (120 mi). 1965 May 15 - . 08:00 GMT - . Launch Site: Kapustin Yar. Launch Complex: Kapustin Yar V-2. Launch Vehicle: R-11. 1965 May 18 - . 09:07 GMT - . Launch Site: Kapustin Yar. Launch Complex: Kapustin Yar V-2. Launch Vehicle: R-11. 1977 Nov - . Launch Site: Kapustin Yar. LV Family: R-11. Launch Vehicle: R-17VTO. Nation: Russia. Agency: RVSN. Apogee: 86 km (53 mi). 1978? - . Launch Site: Kapustin Yar. LV Family: R-11. Launch Vehicle: R-17VTO. 1979 September 29 - . Launch Site: Kapustin Yar. LV Family: R-11. Launch Vehicle: R-17VTO. 1983? - . Launch Site: Kapustin Yar. LV Family: R-11. Launch Vehicle: R-17VTO. UGCh ZLKI 2 - . Nation: Russia. Agency: RVSN. Apogee: 86 km (53 mi). UGCh ZLKI 1 - . Nation: Russia. Agency: RVSN. Apogee: 86 km (53 mi). 1984? - . Launch Site: Kapustin Yar. LV Family: R-11. Launch Vehicle: R-17VTO. UGCh ZLKI 3 - . Nation: Russia. Agency: RVSN. Apogee: 86 km (53 mi). 1984 April 1 - . Launch Site: Gitdaeryung. LV Family: R-11. Launch Vehicle: Hwasong 5. Test mission - . Nation: Korea North. Agency: Choson. Apogee: 200 km (120 mi). 1984 September 1 - . Launch Site: Gitdaeryung. LV Family: R-11. Launch Vehicle: Hwasong 5. 1984 September 24 - . Launch Site: Kapustin Yar. LV Family: R-11. Launch Vehicle: R-17VTO. 1984 October 31 - . Launch Site: Kapustin Yar. LV Family: R-11. Launch Vehicle: R-17VTO. 1985? - . Launch Site: Kapustin Yar. LV Family: R-11. Launch Vehicle: R-17VTO. UGCh ZLKI 7 - . Nation: Russia. Agency: RVSN. Apogee: 86 km (53 mi). 1985 - . Launch Site: Kapustin Yar. LV Family: R-11. Launch Vehicle: R-17VTO. 1985 Mar - . Launch Site: Kermanshah. LV Family: R-11. Launch Vehicle: Shahab 1. Weapon - . Nation: Iran. Apogee: 100 km (60 mi). 1985 March 12 - . Launch Site: Kermanshah. LV Family: R-11. Launch Vehicle: Shahab 1. Kirkuk - . Nation: Iran. Apogee: 100 km (60 mi). 1985 March 14 - . Launch Site: Kermanshah. LV Family: R-11. Launch Vehicle: Shahab 1. Baghdad - . Nation: Iran. Apogee: 100 km (60 mi). 1986 - . Launch Site: Kapustin Yar. LV Family: R-11. Launch Vehicle: R-17VTO. UGCh ZLKI 8 - . Nation: Russia. Agency: RVSN. Apogee: 86 km (53 mi). 1986 Mar? - . Launch Site: Kapustin Yar. LV Family: R-11. Launch Vehicle: R-17VTO. UGCh LKI III-1 - . Nation: Russia. Agency: RVSN. Apogee: 86 km (53 mi). 1987 August 3 - . Launch Site: Scud Batteries. LV Family: R-11. Launch Vehicle: Al Hussein. Range test, 615 km - . Nation: Iraq. Apogee: 100 km (60 mi). 1987 December 28 - . Launch Site: Scud Batteries. LV Family: R-11. Launch Vehicle: Al Hussein. Combat valid. test - . Nation: Iraq. Apogee: 100 km (60 mi). 1988 February 29 - . Launch Site: Al Amarah. LV Family: R-11. Launch Vehicle: Al Hussein. vs Tehran - . Nation: Iraq. Apogee: 100 km (60 mi). 1988 March 1 - . Launch Site: Al Amarah. LV Family: R-11. Launch Vehicle: Al Hussein. 1988 April 25 - . Launch Site: Tall Afar. LV Family: R-11. Launch Vehicle: Al Abbas. Test flight - . Nation: Iraq. Apogee: 100 km (60 mi). 1988 June 27 - . Launch Site: Tall Afar. LV Family: R-11. Launch Vehicle: Al Abbas. 1988 June 28 - . Launch Site: Tall Afar. LV Family: R-11. Launch Vehicle: Al Abbas. 1988 June 29 - . Launch Site: Tall Afar. LV Family: R-11. Launch Vehicle: Al Abbas. 1989 February 12 - . Launch Site: Tall Afar. LV Family: R-11. Launch Vehicle: Al Abbas. 1989 July 27 - . Launch Site: Scud Batteries. LV Family: R-11. Launch Vehicle: Al Hussein. 1989 August 21 - . Launch Site: Tall Afar. LV Family: R-11. Launch Vehicle: Al Abbas. 1989 Sep - . Launch Site: Kapustin Yar. LV Family: R-11. Launch Vehicle: R-17VTO. UGCh LKI III-22 - . Nation: Russia. Agency: RVSN. Apogee: 86 km (53 mi). 1990 January 2 - . Launch Site: Scud Batteries. LV Family: R-11. Launch Vehicle: Short Al Hussein. 1990 January 2 - . Launch Site: Scud Batteries. LV Family: R-11. Launch Vehicle: Al Hussein. 1990 April 8 - . Launch Site: Scud Batteries. LV Family: R-11. Launch Vehicle: Al Hussein. Chemical warhead - . Nation: Iraq. Apogee: 100 km (60 mi). 1990 April 8 - . Launch Site: Scud Batteries. LV Family: R-11. Launch Vehicle: Short Al Hussein. 1990 April 18 - . Launch Site: Scud Batteries. LV Family: R-11. Launch Vehicle: Al Hijara. 1990 June 1 - . Launch Site: Gitdaeryung. LV Family: R-11. Launch Vehicle: Hwasong 6. 1990 June 27 - . Launch Site: Tall Afar. LV Family: R-11. Launch Vehicle: Al Hussein. Separating RV test - . Nation: Iraq. Apogee: 100 km (60 mi). 1990 August 15 - . Launch Site: Scud Batteries. Launch Pad: IRAQ-S. LV Family: R-11. Launch Vehicle: Al Hussein. Weapon test - . Nation: Iraq. Apogee: 100 km (60 mi). 1990 December 1 - . Launch Site: Scud Batteries. Launch Pad: IRAQ-A. LV Family: R-11. Launch Vehicle: Al Hussein. Weapon/test - . Nation: Iraq. Apogee: 100 km (60 mi). 1990 December 28 - . Launch Site: Umm Qasr. LV Family: R-11. Launch Vehicle: Al Abbas. 1991 January 17 - . Launch Site: Scud Batteries. Launch Pad: IRAQ-W. LV Family: R-11. Launch Vehicle: Al Hussein. Israel - . Nation: Iraq. Apogee: 100 km (60 mi). 1991 January 19 - . Launch Site: Scud Batteries. Launch Pad: IRAQ-W. LV Family: R-11. Launch Vehicle: Al Hussein. 1991 January 20 - . 18:43 GMT - . Launch Site: Scud Batteries. Launch Pad: IRAQ-S. LV Family: R-11. Launch Vehicle: Al Hussein. Dhahran - . Nation: Iraq. Apogee: 100 km (60 mi). 1991 January 21 - . 08:29 GMT - . Launch Site: Scud Batteries. Launch Pad: IRAQ-S. LV Family: R-11. Launch Vehicle: Al Hussein. 1991 January 21 - . 09:42 GMT - . Launch Site: Scud Batteries. Launch Pad: IRAQ-S. LV Family: R-11. Launch Vehicle: Al Hussein. Riyadh - . Nation: Iraq. Apogee: 100 km (60 mi). 1991 January 21 - . 19:18 GMT - . Launch Site: Scud Batteries. Launch Pad: IRAQ-S. LV Family: R-11. Launch Vehicle: Al Hussein. Combat launch - target: Al Jubail - . Nation: Iraq. Apogee: 100 km (60 mi). 1991 January 22 - . Launch Site: Scud Batteries. Launch Pad: IRAQ-W. LV Family: R-11. Launch Vehicle: Al Hussein. 1991 January 22 - . 00:41 GMT - . Launch Site: Scud Batteries. Launch Pad: IRAQ-S. LV Family: R-11. Launch Vehicle: Al Hussein. 1991 January 22 - . 04:10 GMT - . Launch Site: Scud Batteries. Launch Pad: IRAQ-S. LV Family: R-11. Launch Vehicle: Al Hussein. 1991 January 23 - . 19:54 GMT - . Launch Site: Scud Batteries. Launch Pad: IRAQ-S. LV Family: R-11. Launch Vehicle: Al Hussein. 1991 January 23 - . 19:54 GMT - . Launch Site: Scud Batteries. Launch Pad: IRAQ-W. LV Family: R-11. Launch Vehicle: Al Hussein. 1991 January 25 - . Launch Site: Scud Batteries. Launch Pad: IRAQ-W. LV Family: R-11. Launch Vehicle: Al Hussein. 1991 January 25 - . 19:23 GMT - . Launch Site: Scud Batteries. Launch Pad: IRAQ-S. LV Family: R-11. Launch Vehicle: Al Hussein. 1991 January 26 - . Launch Site: Scud Batteries. Launch Pad: IRAQ-W. LV Family: R-11. Launch Vehicle: Al Hussein. 1991 January 26 - . 00:28 GMT - . Launch Site: Scud Batteries. Launch Pad: IRAQ-S. LV Family: R-11. Launch Vehicle: Al Hussein. 1991 January 26 - . 19:46 GMT - . Launch Site: Scud Batteries. Launch Pad: IRAQ-S. LV Family: R-11. Launch Vehicle: Al Hussein. 1991 January 28 - . 17:55 GMT - . Launch Site: Scud Batteries. Launch Pad: IRAQ-S. LV Family: R-11. Launch Vehicle: Al Hussein. 1991 February 1 - . Launch Site: Scud Batteries. Launch Pad: IRAQ-W. LV Family: R-11. Launch Vehicle: Al Hussein. 1991 February 2 - . Launch Site: Scud Batteries. Launch Pad: IRAQ-W. LV Family: R-11. Launch Vehicle: Al Hussein. 1991 February 2 - . 21:41 GMT - . Launch Site: Scud Batteries. Launch Pad: IRAQ-S. LV Family: R-11. Launch Vehicle: Al Hussein. 1991 February 7 - . 22:54 GMT - . Launch Site: Scud Batteries. Launch Pad: IRAQ-S. LV Family: R-11. Launch Vehicle: Al Hussein. 1991 February 11 - . 19:20 GMT - . Launch Site: Scud Batteries. Launch Pad: IRAQ-S. LV Family: R-11. Launch Vehicle: Al Hussein. 1991 February 14 - . 08:45 GMT - . Launch Site: Scud Batteries. Launch Pad: IRAQ-S. LV Family: R-11. Launch Vehicle: Al Hussein. Hafir Al Batin - . Nation: Iraq. Apogee: 100 km (60 mi). 1991 February 15 - . 23:01 GMT - . Launch Site: Scud Batteries. Launch Pad: IRAQ-S. LV Family: R-11. Launch Vehicle: Al Hussein. 1991 February 21 - . 14:06 GMT - . Launch Site: Scud Batteries. Launch Pad: IRAQ-S. LV Family: R-11. Launch Vehicle: Al Hussein. Combat launch - target: King Khalid Military City - . Nation: Iraq. Apogee: 100 km (60 mi). 1991 February 21 - . 18:00 GMT - . Launch Site: Scud Batteries. Launch Pad: IRAQ-S. LV Family: R-11. Launch Vehicle: Al Hussein. 1991 February 21 - . 23:31 GMT - . Launch Site: Scud Batteries. Launch Pad: IRAQ-S. LV Family: R-11. Launch Vehicle: Al Hussein. Bahrain - . Nation: Iraq. Apogee: 100 km (60 mi). 1991 February 23 - . 01:59 GMT - . Launch Site: Scud Batteries. Launch Pad: IRAQ-S. LV Family: R-11. Launch Vehicle: Al Hussein. 1991 February 24 - . Launch Site: Scud Batteries. Launch Pad: IRAQ-W. LV Family: R-11. Launch Vehicle: Al Hussein. 1991 February 24 - . 01:32 GMT - . Launch Site: Scud Batteries. Launch Pad: IRAQ-S. LV Family: R-11. Launch Vehicle: Al Hussein. 1991 February 24 - . 06:23 GMT - . Launch Site: Scud Batteries. Launch Pad: IRAQ-S. LV Family: R-11. Launch Vehicle: Al Hussein. 1991 February 24 - . 09:17 GMT - . Launch Site: Scud Batteries. Launch Pad: IRAQ-S. LV Family: R-11. Launch Vehicle: Al Hussein. 1991 February 25 - . Launch Site: Scud Batteries. LV Family: R-11. Launch Vehicle: Al Hijara. Israel-Negev - . Nation: Iraq. Apogee: 100 km (60 mi). 1991 February 25 - . 17:32 GMT - . Launch Site: Scud Batteries. Launch Pad: IRAQ-S. LV Family: R-11. Launch Vehicle: Al Hussein. 1991 February 25 - . 22:26 GMT - . Launch Site: Scud Batteries. Launch Pad: IRAQ-S. LV Family: R-11. Launch Vehicle: Al Hussein. Qatar - . Nation: Iraq. Apogee: 100 km (60 mi). 1991 July 1 - . Launch Site: Chiha-ri. LV Family: R-11. Launch Vehicle: Hwasong 6. Nation: Korea North. Agency: SYMC. Apogee: 200 km (120 mi). 1993 May 29 - . Launch Site: Gitdaeryung. LV Family: R-11. Launch Vehicle: Hwasong 6. 1993 May 30 - . Launch Site: Gitdaeryung. LV Family: R-11. Launch Vehicle: Hwasong 6. 1994 May 12 - . Launch Site: Yemen. LV Family: R-11. Launch Vehicle: Hwasong 6. Sanaa (total 30) - . Nation: Yemen. Apogee: 100 km (60 mi). 1994 Jun - . Launch Site: Yemen. LV Family: R-11. Launch Vehicle: Hwasong 6. Sanaa - . Nation: Yemen. Apogee: 100 km (60 mi). 1994 Jul - . Launch Site: Yemen. LV Family: R-11. Launch Vehicle: Hwasong 6. 1994 November 6 - . Launch Site: Kermanshah. LV Family: R-11. Launch Vehicle: Shahab 1.
vs Camp Ashraf - . Nation: Iran. Apogee: 100 km (60 mi). 1997 February 7 - . Launch Site: Bigen Island. LV Family: R-11. Launch Vehicle: Scud. Willow Dune Target mission - . Nation: USA. Agency: US Army. Apogee: 200 km (120 mi). 1997 March 19 - . Launch Site: Bigen Island. LV Family: R-11. Launch Vehicle: Scud. 1999 June 10 - . Launch Site: Kermanshah. LV Family: R-11. Launch Vehicle: Shahab 1. 1999 November 2 - . Launch Site: Kermanshah. LV Family: R-11. Launch Vehicle: Shahab 1.
vs Camp Habib - . Nation: Iran. Apogee: 100 km (60 mi). 2001 April 18 - . Launch Site: Kermanshah. LV Family: R-11. Launch Vehicle: Shahab 1.
vs MKO camps - . Nation: Iran. Apogee: 100 km (60 mi). 2002 November 14 - . 19:25 GMT - . Launch Site: Vandenberg. Launch Complex: Vandenberg LF7632. LV Family: R-11. Launch Vehicle: Scud B.
GMDS - . Nation: USA. Agency: MDA. Apogee: 46 km (28 mi). 2002 November 25 - . 18:30 GMT - . Launch Site: Vandenberg. Launch Complex: Vandenberg LF7632. LV Family: R-11. Launch Vehicle: Scud B.
GMDS test - . Nation: USA. Agency: MDA. Apogee: 84 km (52 mi). 2003 February 7 - . Launch Site: White Sands. LV Family: R-11. Launch Vehicle: Scud. Nation: USA. Agency: MDA. Apogee: 80 km (49 mi). 2004 July 29 - . Launch Site: Point Mugu. Launch Platform: MLP. LV Family: R-11. Launch Vehicle: Scud. Arrow Target mission - . Nation: USA. Agency: MDA. Apogee: 80 km (49 mi). 2006 July 4 - . 18:32 GMT - . Launch Site: Gitdaeryung. LV Family: R-11. Launch Vehicle: Hwasong 6. Nation: Korea North. Agency: CMIK. Apogee: 150 km (90 mi). 2006 July 4 - . 22:12 GMT - . Launch Site: Gitdaeryung. LV Family: R-11. Launch Vehicle: Hwasong 6. North Korean missile test - . Nation: Korea North. Agency: CMIK. Apogee: 150 km (90 mi). 2007 January 27 - . 05:20 GMT - . Launch Site: Barking Sands. Launch Platform: MLP. LV Family: R-11. Launch Vehicle: Scud. FMA - . Nation: USA. Agency: US Army. Apogee: 100 km (60 mi). 2007 April 6 - . 06:42 GMT - . Launch Site: Barking Sands. Launch Platform: MLP. LV Family: R-11. Launch Vehicle: Scud. 2007 October 27 - . 07:14 GMT - . Launch Site: Barking Sands. Launch Platform: MLP. LV Family: R-11. Launch Vehicle: Scud. THAAD Target - . Nation: USA. Agency: US Army. Apogee: 100 km (60 mi). 2008 June 5 - . 18:13 GMT - . Launch Site: Barking Sands. Launch Platform: MLP. LV Family: R-11. Launch Vehicle: Scud. FMA Target - . Nation: USA. Agency: USN. Type: ABM Target. Apogee: 150 km (90 mi). 2008 September 18 - . 02:05 GMT - . Launch Site: Barking Sands. Launch Platform: MLP. LV Family: R-11. Launch Vehicle: Scud. Nation: USA. Agency: US Army. Apogee: 80 km (49 mi). 2009 March 18 - . 00:25 GMT - . Launch Site: Barking Sands. Launch Platform: MLP. LV Family: R-11. Launch Vehicle: Scud. THAAD Target - . Nation: USA. Type: ABM Target. Apogee: 100 km (60 mi). Target. 2009 September 27 - . Launch Complex: Damghan. LV Family: R-11. Launch Vehicle: Shahab 1. Shahab RV - . Mass: 100 kg (220 lb). Nation: Iran. Operational test. 2009 September 27 - . Launch Complex: Damghan. LV Family: R-11. Launch Vehicle: Shahab 2. 2010 February 12 - . 04:30 GMT - . Launch Pad: Pacific Ocean, Pacific Ocean off San Nicolas Islan. Launch Platform: MLP. LV Family: R-11. Launch Vehicle: Scud. ABL shoots down Scud target. - . Nation: USA. Agency: MDA. Type: ABM Target. Apogee: 150 km (90 mi). First test of the Airborne Laser against a foreign-technology missile target. The ABL destroyed the Scud liquid-fueled short-range ballistic missile launched from a mobile platform at sea. The entire engagement, including atmospheric compensation for the high-energy laser while the ballistic missile's rocket motor was still firing, occurred less than one minute from target launch. 2010 June 29 - . 07:32 GMT - . Launch Site: Barking Sands. Launch Complex: Barking Sands MLP. Launch Platform: MLP. LV Family: R-11. Launch Vehicle: Scud. FTT-14 Target - . Nation: USA. Agency: MDA. Type: ABM Target. Apogee: 80 km (49 mi). ABM Target. 2010 September 1 - . Launch Site: Point Mugu. LV Family: R-11. Launch Vehicle: Scud. RV - . Nation: USA. Agency: MDA. Type: ABM Target. Apogee: 100 km (60 mi). ABM target..
2011 June 28 - . Launch Site: Semnan. Launch Complex: Damghan. LV Family: R-11. Launch Vehicle: Shahab 1. Shahab RV - . Nation: Iran. Operational test..
2011 June 28 - . Launch Site: Semnan. Launch Complex: Damghan. LV Family: R-11. Launch Vehicle: Shahab 2. 2011 October 5 - . 05:56 GMT - . Launch Site: Barking Sands. Launch Platform: MLP. LV Family: R-11. Launch Vehicle: Scud. FTT-12 Target - . Nation: USA. Agency: MDA. Type: ABM Target. Apogee: 100 km (60 mi). Target mission. Probably a Scud surrogate of some kind launched from the Mobile Launch Platform ship (former USS Tripoli) off Kauai..
2012 July 3 - . Launch Site: Semnan. Launch Complex: Damghan. LV Family: R-11. Launch Vehicle: Shahab 2. Shahab RV - . Nation: Iran. Apogee: 100 km (60 mi). Exercise mission..
2012 July 3 - . Launch Site: Semnan. Launch Complex: Damghan. LV Family: R-11. Launch Vehicle: Shahab 1. 2012 October 25 - . Launch Site: Kwajalein. Launch Pad: BOA-NE. Launch Platform: MLP. LV Family: R-11. Launch Vehicle: Scud. FTI-01 PAC-3 Target - . Nation: USA. Agency: MDA. Type: ABM Target. Apogee: 150 km (90 mi). Target mission, part of the FTI-01 missile defence experiment. A short range target missile, possibly a Scud, was launched from the Mobile Launch Platform at northeast Kwajalein; it was intercepted by a Patriot PAC-3 missile launched from Omelek. The PAC-3 interception was at low altitude and not considered a space launch. The exercise also included some low altitude intercepts of cruise missiles by PAC-2 interceptors. 2013 December 14 - . Launch Site: Semnan. LV Family: R-11. Launch Vehicle: Shahab 1. Kavoshgar Pazhuhesh - . Nation: Iran. Apogee: 120 km (70 mi). Eighth in Kavoshgar series of biology missions; Capsule D recovery test. Launched from the Imam Khomeini Space Center in Semnan province on a 120 km suborbital flight, carrying a 3 kg, 3 year old rhesus monkey named Fargam. This was the fourth Iranian monkey in space, and the second to return successfully following the Kavoshgar Pisgham ('Pioneer Probe') mission in January 2013. The use of a liquid fuel missile provided gentler acceleration than the small solid propellant sounding rockets used for earlier experiments. The Kavoshgar Pazhuhesh ('Research Probe') flight was the first 'Class D' mission of the Kavoshgar series. The payload was developed by the Institute of Astronautical Systems, which I believe is part of the Aerospace Research Institute in Tehran. 2014 February 27 - . 08:42 GMT - . Launch Site: Gitdaeryung. LV Family: R-11. Launch Vehicle: Hwasong 5. Hwasong RV - . Nation: Korea North. Apogee: 80 km (49 mi). Military training. 2014 February 27 - . 08:42 GMT - . LV Family: R-11. Launch Vehicle: Hwasong 5. Hwasong RV - . Nation: Korea North. Military training. 2014 March 2 - . 21:19 GMT - . LV Family: R-11. Launch Vehicle: Hwasong 6. 2014 March 2 - . 21:19 GMT - . Launch Site: Gitdaeryung. LV Family: R-11. Launch Vehicle: Hwasong 6. Hwasong RV - . Nation: Korea North. Apogee: 150 km (90 mi). Military training. Hwasong 6 RV? - . Nation: Korea North. Apogee: 100 km (60 mi). Test flight..
2015 March 1 - . 21:33 GMT - . Launch Site: Nampo. LV Family: R-11. Launch Vehicle: Hwasong 6. RV - . Nation: Korea North. Apogee: 134 km (83 mi). Test flight..
2015 March 1 - . 21:41 GMT - . Launch Site: Nampo. LV Family: R-11. Launch Vehicle: Hwasong 6. 2015 June 6 - . Launch Site: Sa'dah. LV Family: R-11. Launch Vehicle: Hwasong 6. Warhead - . Nation: Yemen. Apogee: 80 km (49 mi). Asnar Allah forces in Sa'dah, Yemen launched a Scud at King Khaled Air Base in Saudi Arabia. The missile was reportedly intercepted by two US Patriot missiles..
2015 June 30 - . Launch Site: Sa'dah. LV Family: R-11. Launch Vehicle: Hwasong 6. Warhead - . Nation: Yemen. Apogee: 80 km (49 mi). Combat launch by Yemeni rebels against Saudi target; reportedly intercepted by Saudi Patriot missiles..
2015 August 26 - . Launch Site: Yemen. LV Family: R-11. Launch Vehicle: Hwasong 6. Warhead - . Nation: Yemen. Apogee: 80 km (49 mi). Missile launch. Impacted Jizan, Saudi Arabia..
2016 March 8 - . Launch Site: Qom. LV Family: R-11. Launch Vehicle: Shahab 1. 2016 March 9 - . 20:20 GMT - . Launch Site: Chiha-ri. LV Family: R-11. Launch Vehicle: Hwasong 6. Hwasong RV - . Nation: Korea North. Apogee: 150 km (90 mi). Test mission. Impacted in Sea of Japan..
2016 July 18 - . 20:45 GMT - . Launch Site: Eunyul. LV Family: R-11. Launch Vehicle: Hwasong 6. RV - . Nation: Korea North. Apogee: 100 km (60 mi). Test mission. Impacted in Sea of Japan..
2017 April 4 - . 21:42 GMT - . Launch Site: Sinpo. LV Family: R-11. Launch Vehicle: Hwasong 6. RV - . Nation: Korea North. Apogee: 189 km (117 mi). Test mission. Impacted Sea of Japan..
2017 May 28 - . 20:39 GMT - . Launch Site: Wonsan. LV Family: R-11. Launch Vehicle: Hwasong 6. RV - . Nation: Korea North. Apogee: 150 km (90 mi). Test mission. Impacted Sea of Japan..